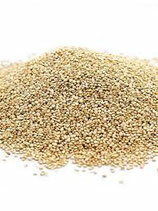 (pronounced Keen-wah) is a "supergrain", containing more protein than any other grain. It is packed with lysine and other healthy amino acids and is gluten-free, making it easy to digest. It contains more iron than other grains, and has high levels of calcium, potassium, riboflavin, magnesium, zinc, copper, B Vitamins and folacin. Unlike other grains it contains plenty of the amino acid lysine, methionine and cystine, making it complementary to both other grains and to legumes, which are deficient in these nutrients, so it provides complete protein. Now available by 500g and 1kg. Choose the quantity by clicking on the drop down menu.